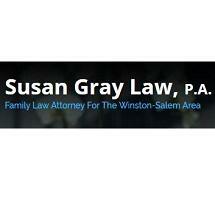 At Susan Gray Law, P.A., in Winston-Salem, North Carolina, attorney Susan Gray is a certified family law attorney who provides exceptional skill, experience and service to her clients. Since 1999, attorney Gray has been a board-certified family law specialist, certified by the North Carolina State Bar. Law-practice certifications are difficult to achieve. Her certification in family law signifies her knowledge and the level of commitment she brings to her clients. In your first meeting with attorney Gray, she will listen to your story. She will learn what you want to accomplish. Then she will lay out your legal options and set expectations. As your lawyer, she will build a legal strategy that gets results. At Susan Gray Law, P.A., we have a roster of experts we can call on to examine evidence and strengthen your legal position. These professionals include accountants, certified business valuation experts, forensic computer experts and occupational/vocational experts. Attorney Gray earned her law degree from the University of Tennessee and her bachelor’s degree from Vanderbilt University. Family law matters are difficult, but at Susan Gray Law, P.A., we strive to make the process easier and to achieve the best possible outcome.